Vasil Kiryienka made up for Sky’s huge disappointment in the second week of the Giro d’Italia when he took a surprise win in the long time trial of the Italian grand tour. Being an early starter, he benefited from a change of the weather conditions which took the GC riders out of contention, and won the stage with a 12-second margin over Luis Leon Sanchez (Astana). In the GC battle, Alberto Contador (Tinkoff-Saxo) was in a class of his own as he finished third on the stage and reclaimed the maglia rosa with an advantage of 2.28 over Fabio Aru (Astana) who defended himself well by finishing 29th. Stage 14 was always expected to be a big day for Team Sky as it was the day that Richie Porte has targeted as an opportunity to gain time on his rivals and move into the maglia rosa. The prediction of a successful day for the Brits turned out to be right but the circumstances were markedly different from what most had expected. With his huge amount of bad luck, Porte had already been taken out of contention for the overall win and he was unable to bounce back in the stage that had always been his big goal. With a poor performance, the Australian finished 55th and seems to have cracked mentally due to the huge amount of adversity. However, Sky still ended on the top step of the podium as loyal domestique Vasil Kiryienka suddenly got a chance to ride for himself. Instead of saving himself for the upcoming mountain stages, he was allowed to go full gas and for the first time ever he came away with the win in a big time trial. On a wet day in Italy, he was an early starter and during his ride, it was clear that he was on a good day. He was the fastest at every time check and when he crossed the line, he had gone 23 seconds faster than Patrick Gretsch (Ag2r) who was the fastest at that point. Kiryienka now faced a long wait in the hot seat and most expected his time to get beaten by the big favourites among the GC riders. However, he got some unexpected help from the weather as the wind suddenly changed and gave the late starters a big disadvantage in the flat headwind section at the start. All the pre-race favourites were far behind Kiryienka at the first time check and it became clear that it would be impossible for anyone to deny the Belarusian the win. Luis Leon Sanchez (Astana) gave him a brief scare when he slotted into second with a time that was 12 seconds off the mark but apart from that everyone was far off the mark. That didn’t make the battle for the GC less exciting as the stage had the potential to create some huge time gaps and as expected, the overall standings was turned completely on its head. The big winner was Alberto Contador who was the only GC rider to get close to Kiryienka. At the first time check, he had lost more than a minute to the strong Belarusian but he gradually took back time and when he reached the finish, he was just 13 seconds off the mark in third. Contador may have missed out on the stage win but that will not be a big issue for the Spaniard as he gained lots of time on all his overall rivals. Fabio Aru only got one day in the maglia rosa as he could only manage 29th and so he dropped to second with a deficit of 2.28. The other big winners were Andrey Amador (Movistar) and Jurgen Van Den Broeck (Lotto Soudal) who both had great rides to finish in the top 15 and move into third and fifth respectively. 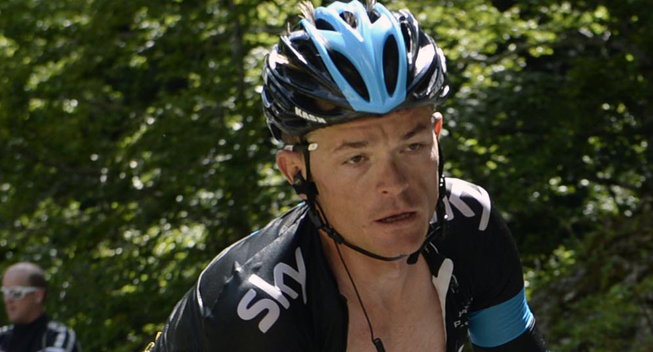 Leopold König (Sky) also put in a good ride to keep Sky’s GC options alive and he is now fourth overall. Rigoberto Uran (Etixx-QuickStep) had hoped to gain a lot of time in this stage but the Colombian was on a bad day. With a time of 1.20.37, he was only 6 seconds faster than Aru but nonetheless moved into fourth in the overall standings. In addition to Aru’s time loss, Dario Cataldo and Mikel Landa both lost a huge amount of time and slipped down in the overall standings. They are both still in the top 10 overall but Astana no longer have three riders in the top 5 of the overall standings. We should be in for another shake-up of the GC tomorrow when the race continues with the first stage in the high mountains. After a flat start, the riders will tackle a category 2 climb in the first half before they descend to the difficult finale. Here they will first go up the brutally steep Passo Daone and then take on the long climb to the finish in Madonna di Campiglio where another GC battle will unfold. After yesterday’s dramatic flat stage, it was time for the stage that has been described as the most important of the entire race. Stage 14 was the 59.4km time trial from Treviso to Valdobbiadene and the mammoth test was expected to create huge time differences. The course was a mixed affair as the first half was completely flat on long, straight roads while the second half was rolling with two short climbs and a bit of descending. Marco Coledan (Trek) was the first rider down the ramp at 12.00 CEST and he took off under torrential rain. He may have been the first to hit the course but it was Michael Hepburn (Orica-GreenEDGE) who was the first to reach the finish, despite the fact that he was the third rider to start. He stopped the clock in 1.21.05 to set an early best mark. However, Hepburn soon learned that his time in the hot seat would be limited. At the first time check, Nikolay Mihaylov (CCC) was six seconds faster and when he got to the third and final check, the Bulgarian had put 26 seconds into the Australian. As he reached the finish, the clock stopped in 1.20.32 and placed the CCC rider firmly in the hot seat. Christopher Juul Jensen (Tinkoff-Saxo) would be the first rider to challenge Mihaylov but at the finish he fell 16 seconds shy of the lead. Instead, the Bulgarian got a scare when Aleksandr Porsev (Katusha) set a first split time that was 6 seconds faster than his. However, the Russian sprinter was unable to maintain the speed and in the end he could only manage second, falling 7 seconds shy of the lead. Maarten Tjallingii (LottoNL) was the next rider to slot into the top 5 when he set the fourth best time before sprinter Elia Viviani (Sky) had a good ride to move into sixth. However, it was Luke Durbridge (Orica-GreenEDGE) who pushed Mihaylov out of the hot seat when he stopped the clock in 1.19.28 to lower the mark by a massive 54 seconds. Chad Haga (Giant-Alpecin) had a great ride to move into second but he was quickly pushed down to third by Kristof Vandewalle (Trek) who came back from a crash to stop the clock in 1.19.33. However, it was already clear that Gretsch and Kiryienka were riding faster and as they were almost equal at the final time check, everything was set for a thriller. Gretsch stopped the clock in 1.18.15 to lower the mark considerably but he didn’t even get the chance to move into the hot seat. Tobias Ludvigsson (Giant-Alpecin) just held off the flying Kiryienka to slot into second with 1.19.19 before the Belarusian went 23 seconds faster than Gretsch. Manuel Boaro (Tinkoff-Saxo) cracked the top 10 by setting the 10th best time before Sylvain Chavanel (IAM) again did a good time trial by slotting into fifth. Moments later Kanstantsin Siutsou continued the good Sky performances by setting the 10th best time. Fabio Felline (Trek) has suddenly turned into somewhat of a TT specialist and he confirmed his progress by setting the third best time. That was much better than Ilnur Zakarin (Katusha) who could not even make it into the top 30. Martijn Keizer (LottoNL) set the 8th best time at a time when all the GC riders had now started their rides and it soon became apparent that the weather conditions had changed. However, Sanchez managed to do his ride in less windy conditions and could set the second best time. Tanel Kangert made it two Astana riders in the top 4 when he set the fourth best time before Ryder Hesjedal (Cannondale) did a surprisingly good ride to take 12th after Stef Clement (IAM) and Ion Izagirre (Movistar) had both made it into the top 15. Moments later Steven Kruijswijk (LottoNL) created a big surprise by setting the fourth best time. Porte could only manage 41st and instead it was König who did a very good performance for Sky by taking 11th despite the windy conditions. However, he was beaten by Van Den Broeck who did the time trial of his life to slot into sixth. Giovanni Visconti (Movistar) did a decent performance to go faster than Porte and his teammate Amador was even better when he slotted into the top 15. Damiano Caruso (BMC) had a fine ride to take 30th before a disappointed Uran slotted into 22nd. Cataldo had a bad day to set the slowest time of the riders in the top 9 until Roman Kreuziger (Astana) did even worse. However, all eyes now were on Contador who had passed his three-minute man Landa and powered across the line in third. This left just two Astana riders on the course. Landa made a solid comeback in the second part but he still lost 4 minutes to Contador. Aru put in a heroic ride to finish 29th but there was nothing he could do against the unstoppable Contador.